You don’t say! I’d never guessed! Yeah, I keep it under wraps pretty well. But, there are times when I just can’t deny my inner literary curiosity and psych-outs about things book related. 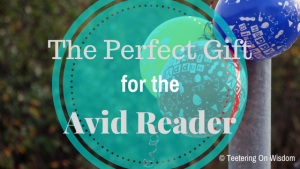 So, you can only imagine how I reacted when I was scrolling through Pinterest for DIY Christmas gifts and found bookish DIY projects. 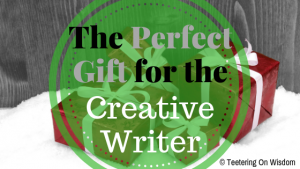 While there are many gifts that you can give a reader and writer, making the gifts make them that much more special. But, do they really have to be for someone else? If you’re going to invest that much time into a DIY project like one of the ones I compile below, you might as well remind yourself that you’re special, too! The links, patterns, tutorials, and other things I include in this article are not created, tested, or approved by me in any way. They are ideas that I would love to try myself, but I don’t represent or claim responsibility for any of them because they’re not mine. If you have a problem, I suggest you read the idea creator’s and my own terms and conditions (each) to find out more. If you’re inclined to “needle crafts” (knit, crochet, sew), this is right up your alley! 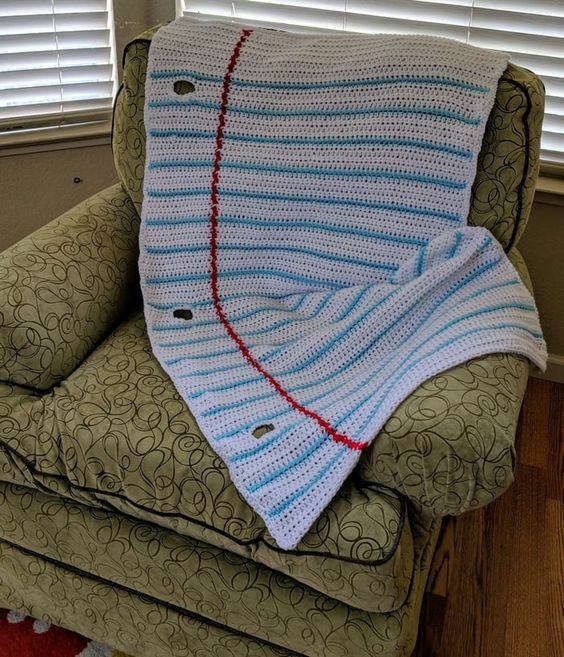 I know I’m totally considering making myself one as the cold front comes in! Maybe with a matching pencil pillow… Hmm… ‘bout to get hella creative this winter! Unfortunately, I am unable to find a pattern for it. But, if you’re an experienced needle-crafter, it seems pretty self-explanatory. My heart hurt looking at this tutorial as they cut out the middle of the pages. Hurting books always breaks my heart. Nevertheless, this one is awesome and would probably be best done on used books from a thrift store or something. I have a personal library, so I could totally hide stuff in a few of these and put them on my shelves with no one the wiser! So clever! Find the tutorial from Tim and Mary Vidra here. Again, hurting books hurt me, but this is too cool; aspirin will just have to do! 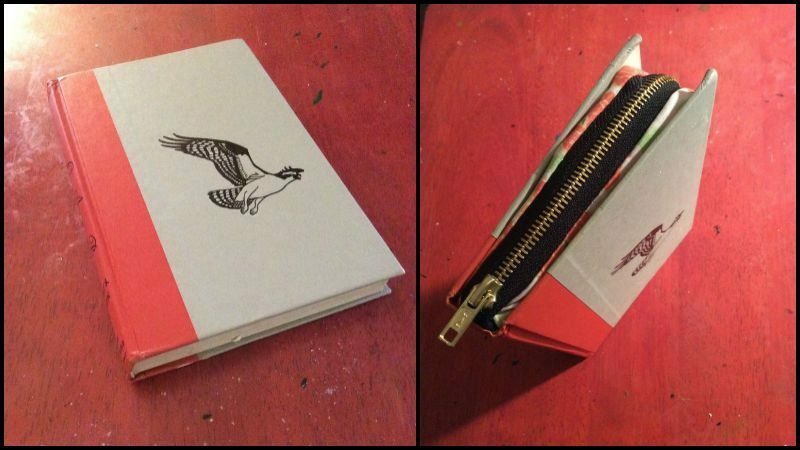 This woman made a purse clutch out of a book and posted a full tutorial. It’s SO extensive; I’m not sure if it’s something I can bring myself to do anytime soon (though, I may try it one day). However, the final product is so awesome, it seems totally worth the effort! You can find Sarah’s full tutorial on her site here. And, if you have sewing skizzel, you can create one with a zipper, as described here. 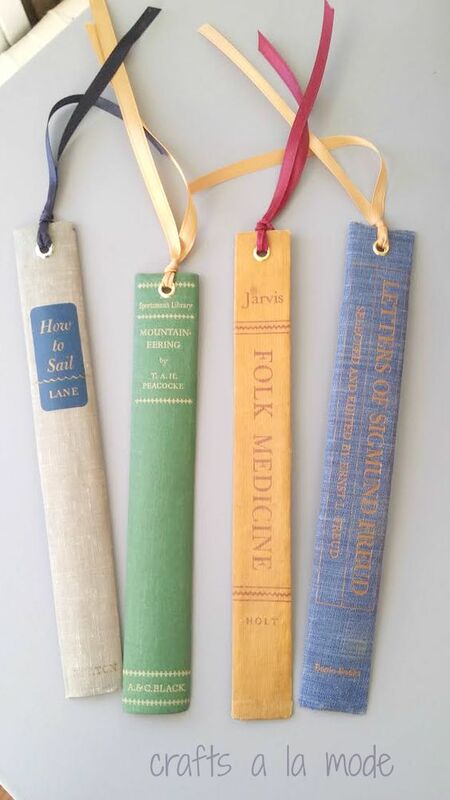 Of course, if you’re a reader, these would be so awesome to have! Yeah, you can just buy a paper one with the same spine, for less work, and easier to fit in your book, but–where’s the fun in that?! I would totally like to try this with hardcover (or even softcover) spines. Seems easy, though the tutorial doesn’t really give much detail on how to do it. That tutorial from Linda Bouffard can be found here. 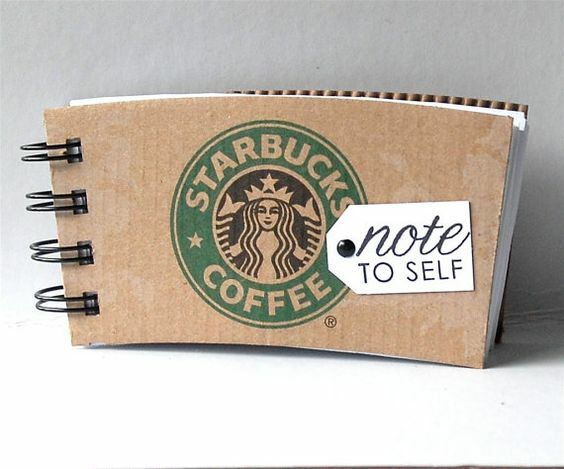 You’ve probably noticed that I love journaling. Because of this weakness, and my teacher inclinations, I tend to horde notebooks during my favorite shopping season–Back to School. 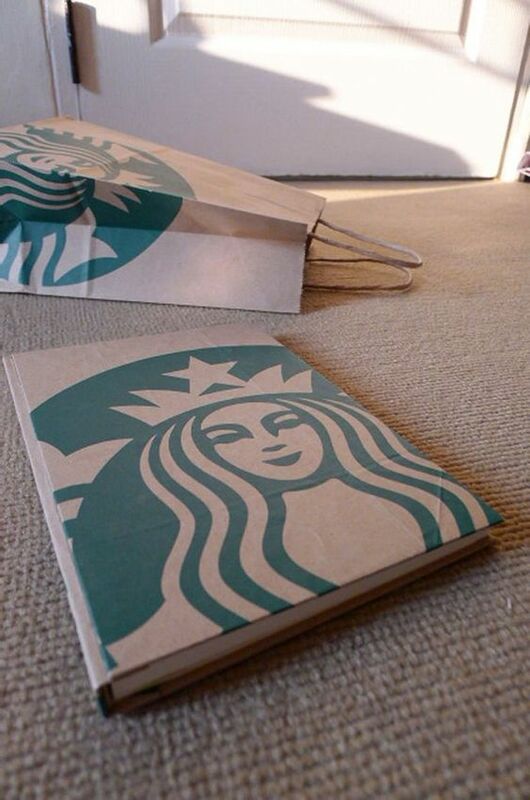 So, when I saw this picture of a homemade Starbucks journal, I was so psyched ‘cause I’d totally do that! Now, the pin leads to Etsy store to buy one. However, I think you could make one on your own with a little imagination and trial and error. Or, at least that’s how I roll! You can buy it from paperpurr here, though. Similarly, you can make pocket/purse-sized ones like this. CampFire Designs sales them on Etsy here. Or, again, get creative! Why does that feel like the ultimate common sense? I mean, the word “book” is in the word “bookend”! So, wouldn’t it make sense that bookends are made of books? Don’t answer that. 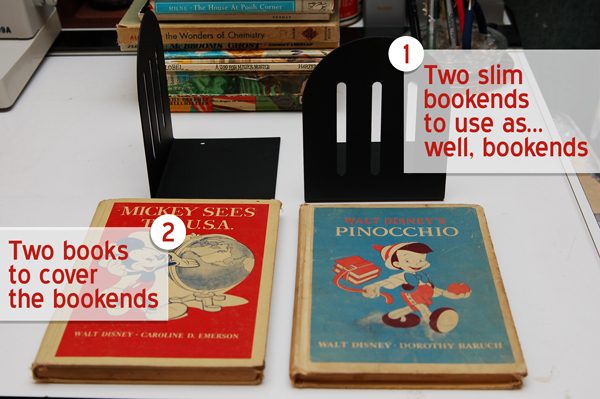 But, a simple and cool project you can do is just that: make bookends out of books. Get the full tutorial from Fancy and Schmancy. Oh yes. My house is filled with would–especially old and/or decorative ones; thus, coasters are a must. 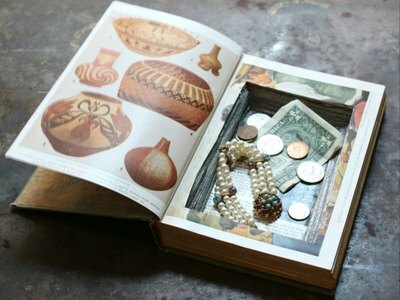 What a great way to sneak in my book love around the house! I’ve made coasters with wood plaques, Modge Podge and pictures before, so it’s not really hard to do. 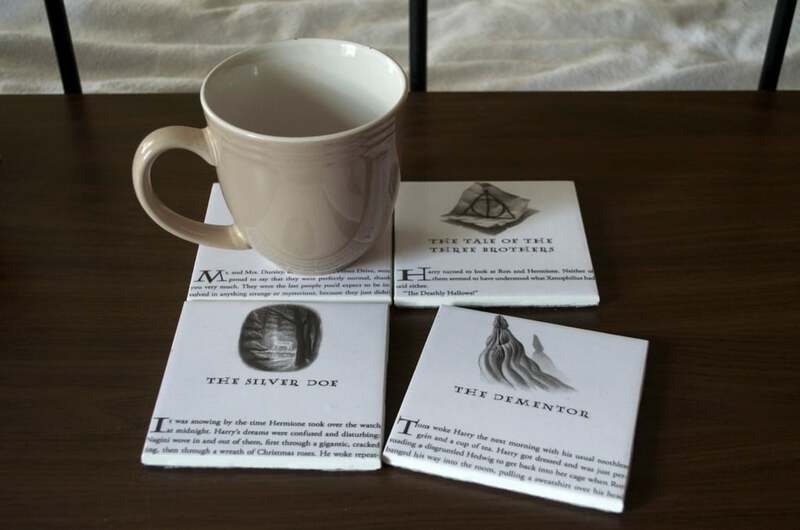 However, with it being paper (and depending on the page thickness) and ceramic tiles, you’ll definitely want to look up a tutorial on how to make coasters the right way with these materials. Hilary White, who posted the idea here, suggested a few materials in the short description. I see this one all over the place and would love to do one myself! I have so many school and crafting supplies, and it would be so awesome to be able to store it on my bookshelves. With the DIY box/basket/organizer craze, this really fits in on a reader-nerd level. 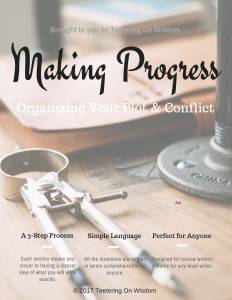 I’ve found tutorials of varying difficulty levels for this project, but Katie King’s on Blitsy seems like the most doable if you have a short attention-span or limited crafting abilities, like me. Notice that all of these are for use, not just decor. There are so many DIY crafts and tutorials for books. However, to destroy a book just to make a flower for the wall seems like disrespect to me! If you’re going to pull apart a book that someone else may want to purchase to read, the least you can do is actually use it! 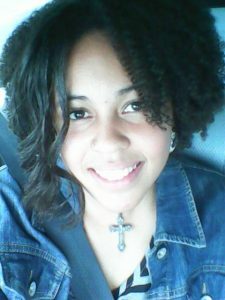 So, that’s what I went for. Hopefully, you’ve found something you can totally pull off yourself. Do you think you can do these? 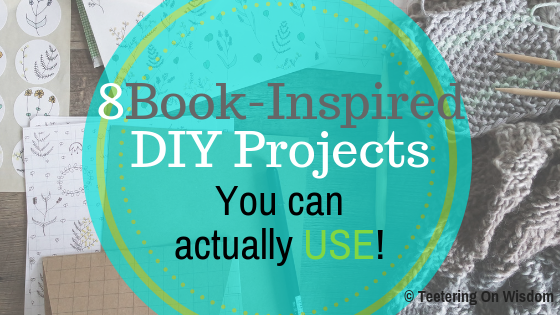 Know any other useful DIY book projects you wanna share with us? Let us know in the comments below and on social media, of course!